Tax credits have been in the news (again!) and this is one issue the Chancellor George Osborne is expected to review in the Autumn Statement coming up at the end of the month. The House of Lords voted to reject the Statutory Instrument which contained the cuts to tax credits. The Chancellor has promised to continue to reform tax credits . . . while at the same time lessening the impact on families ‘during the transition’. It took years before I enjoyed being on stage, without dreading I wouldn’t get any laughs. I still don’t take audiences for granted, because they can cause even the most experienced comedian to have an off-night. Côr Meibion Llanelli Male Voice Choir are busy getting ready for what promises to a great Christmas concert at Ffwrnes Theatre, Llanelli. ‘Christmas with the Choir’ will be staged on Saturday, December 12, at 7pm. The concert will feature special guests, including Mynydd Mawr Male Voice Choir. Côr Meibion Llanelli musical director Eifion Thomas said choristers were getting into the Christmas spirit at their twice-weekly rehearsals. He said: “Our Christmas special promises to be a light-hearted celebration of the festive season. It will be something that leaves you with a warm Christmas glow. Mynydd Mawr Choir was formed in 1965 in Tumble in the Gwendraeth Valley – just a year after Côr Meibion Llanelli started. Councillors and staff in Carmarthenshire County Council are being asked to support the Royal British Legion’s two minute silence on Armistice Day. It will take place at 11am tomorrow, Wednesday, November 11. Chief officers and service managers are encouraged to make arrangements, wherever possible, for staff to participate in the short act of remembrance. County Council will stop at 11am at the request of the Chair to observe the silence. "IF WE ARE TO MAINTAIN OUR PEACE AND FREEDOM, WE MUST ALWAYS REMEMBER"
A Llanelli pub has been fined £300 following a complaint that they were putting their business waste in black bags. It is against the law for trade waste to be collected as household waste. All businesses must have a trade waste agreement in place making sure their waste is removed by a licensed waste carrier. The pub was fined £300 by council environmental enforcement officers for failing to produce the relevant paperwork for the removal of their waste. It was unable to produce waste transfer notes showing where the waste was being taken. Executive Board Member for Environmental and Public Protection Cllr Jim Jones said: “All businesses have a responsibility to ensure reasonable measures are taken to dispose of their waste. Blue bags total hits same weight as 73 African elephants! Some 313 tonnes of used blue bags were recycled last year – that’s the same weight as 73 African elephants! Blue bags are taken to the Materials Recycling Facility in Nantycaws, Carmarthen, to be sorted. But it is not only the paper, cardboard, plastic and cans that are sent on to processing plants to be made into new products, the blue bags themselves are too so they can be used again. Executive Board Member for the Environment Cllr Hazel Evans said: “A lot of people want to know what happens to their blue bag after all the items in it are sorted for recycling. Figures show that approximately 60% of rubbish in Carmarthenshire is being recycled, but the Welsh Government has set a target of 70% to achieve by 2024/25. Transforming old railway buildings into community spaces and creating facilities for maritime history, business and sports are among projects sharing in £317,440 of grants from the Big Lottery Fund. The money, from the £9 million Community Asset Transfer 2 Programme (CAT2), aims to provide both capital and revenue funding to support the transfer of assets, such as land and buildings to community ownership. The assets can be transferred from individuals, the public or private sector. Seven initial grants of up to £50,000 each are helping projects develop their ideas before being invited to submit developed applications to the second stage of funding with the aim of securing grants of between £300,000 and £1,150,000. (Read full project descriptions here). Now that the weather is taking a turn for the worse, more people will be reaching for the thermostat or stoking up their wood burners for extra warmth. But Carmarthenshire County Council is urging people to ensure their gas and solid fuel heaters are safe and serviced. Teams from Public Protection, Property Services and Housing are all playing their part in encouraging tenants, landlords and homeowners to check that their boilers, gas and solid fuel fires are properly maintained. Failure to do so could be deadly - on average, 50 people a year across the UK are killed by carbon monoxide (CO2) poisoning due to faulty heating appliances. Carbon monoxide is known as a ‘silent killer’ as it is odourless, colourless and tasteless, making it difficult to detect. It can be given off by appliances that burn fossil fuels such as gas, coal, wood or oil if the appliances are not working properly, the flue is blocked, or the room is not properly ventilated. Heol Nant, Swiss Valley, has to be closed temporarily from its junction with Heol Beili Glas for a total distance of 75 metres in an easterly direction for the Christmas lights switch-on in Swiss Valley, Llanelli. The closure is necessary to ensure public safety while the switch on takes place between 6.15pm to and 7.30pm on Thursday 26th November, 2015. The alternative route for west bound traffic will be to travel in a south-easterly direction along Heol Nant to its junction with Lon Yr Eglwys. At the junction, turn right and continue in a south-westerly direction along Lon Yr Eglwys to its junction with Tegfynydd. There, drivers should turn right and continue in a north-westerly direction along Tegfynydd to its junction with Llandyry. At the junction, turn right and continue in a north-easterly direction along Llandyry and Heol Beili Glas to return to a point west of the closure. Vice versa for east bound traffic. 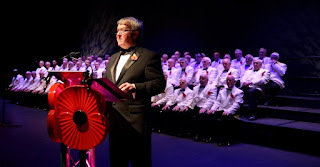 It was a night to remember – and a night for Remembrance. ‘A Night With The Stars’ at Ffwrnes Theatre, Llanelli, was an occasion for showcasing up-and-coming talent – the stars of the future - in Llanelli. And, with a clever change of mood and gear, it also served as on occasion for Remembrance, with an emotional Tribute To the Fallen in the second half of the programme. The event was designed to provide a platform for members of the Loud Applause Rising Stars team to show off their talents. With the sterling support of the Morriston Orpheus Choir, they did just that. Samuel Morris, Jordan Williams, Daniella Difede and Keely Morgan now seem like fully-established and rounded performers in their own right thanks to the nurturing of the Rising Stars programme. They practically have their own fan clubs – and they didn’t disappoint on a night when there was stiff competition for best performer of the night. Visitor numbers to Llanellli’s North Dock have hit an all time high. Bumper figures show that the Millennium Coastal Park site has attracted an extra 1,000 visitors every week in the last six months. More than 52,000 parking tickets have been sold at North Dock from April to November this year compared to 42,000 during the same period last year. Based on three people per car this equates to 30,000 more visitors - an increase of 23 per cent. Ice cream sales have also increased with Joe’s vanilla flavour being the most popular. The huge rise comes just months after a new nautical themed playground opened in April. The grassed facility located in front of the main car park has proved hugely popular with locals and visitors alike.